Choosing Camping Saint-André-Avellin, is choosing to spend a nice holiday! To ensure an enjoyable experience for all our campers, we have established some rules to follow when making a reservation. Camping Saint-André-Avellin is the ideal place for a wonderful holiday, a large campsite with several recreational facilities. Our team is proud to welcome you warmly and will answer all your questions. A 3-day reservation is required for all civic holidays. It is possible to reserve up to a maximum of 56 nights on the same site. If you wish to add a consecutive stay to your reservation you must change to another site. A reservation of 1 to 6 nights requires a deposit valued to the equivalent of 1 night and for a reservation of 6 nights or more a deposit of 25% of the total amount is required. All modifications in either the shortening or transferring to another date will not be possible. From June 23 to August 14th, all sites must be vacant at 1:00 p.m.
For guaranteed fun, at Camping Saint-André-Avellin. You have the choice between a « ready-to-camp » formula, a small cottage or with your own RV or tent. Several services are offered on our ground, mini golf, games, swimming pool, water games, play structures, canoe rentals, etc. Our team strives to make you spend your dream holiday in Saint-André-Avellin. You will be near Parc Oméga, in Montebello we are located near all the services of the city. 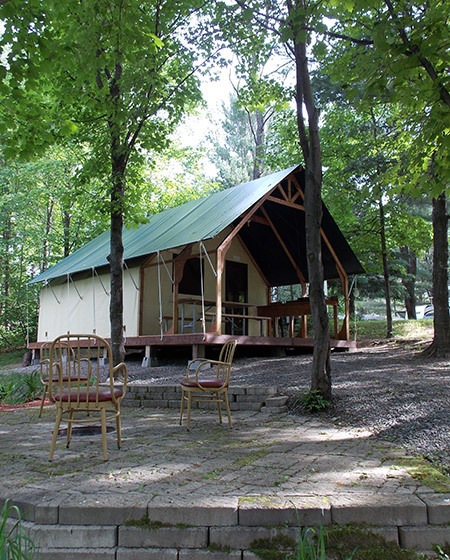 Whether it's a holiday with friends, a couple or a family, you will be charmed by our beautiful region and Saint-André-Avellin campground. We have the solution for campers who want a «turnkey« service with our formulas ready to camp or our small cottage, which allows you to enjoy your stay as soon as you arrive. We also have several campsite with or without service for your outdoor holiday. Book your holiday at Camping Saint-André-Avellin, where fun is guaranteed! The «Ready-to-camp» formula is a new trend in Quebec. Besides, it is a very convenient way to camp when you spend holidays with family or friends since you do not have to install a tent or a RV. Everything is already in place, every facility is equipped with all the essentials and you only have to bring your bedding and your food. Scissors, bottle and can openers, large kitchen utensil set with spatula, etc. 4 person set of dishes, bowls, cups, glasses, utensils, etc.